Post up here to talk to the F.O.T.M. contestants so to not clog up the competition. Have a Question on one of the posts ? post up here and be sure to tag them with the "@" before his name. White Dragon and Warhoss like this. However I like the idea of this as I would get discouraged looking threw multiple post quotes with pictures and see 2 pages of the same thing. Hopefully make for a better main thread. Or at the least easier to read threw. BigBlue 94, sackman9975, White Dragon and 2 others like this. I think it's a great idea too. sackman9975 and Quader1 like this. it is a great idea and I really hope it works out. Best part is I also found a second family here at FSB, made some great friends along the way. 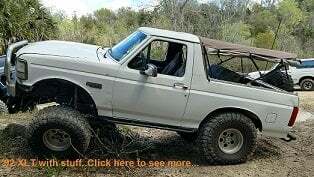 Hard to explain it, but you form a bond with other folks that drive Broncos, and as corny as it sounds owning a Bronco (or maybe it owning you) gets in your blood. You hit the nail dead square on the head here!! 10 inch wide rims..I think. With this set up I have to mindful of my turning radius, they have a tendency to rub the R/A's pretty good in a tight turn. knock wood no broken knuckles and they are stock. adding a set of the duff tubular arms is on my to do list. Happy Birthday to one of our contestants, @jermil01 !!! Great contest fellas, it's looking real nice, and real real tough to choose a winner. Whore out those Broncos and lets all have a good time! White Dragon, Quader1 and PoppaGator like this. BigBlue 94 and Quader1 like this. Last edited by BigBlue 94; 05-19-2018 at 01:40 PM. @RicksBroncoBeast How in the world does the stock 8.8 not snap with a 4BT and all that compound gearing!!! You should change your name to "FeatherFoot"! @RicksBroncoBeast hows the mileage with your setup? Mileage is great. I went from 11 MPG's to 16 MPG's. If I were to change the gears to 4.10:1 it would increase to about 20+. These engines are super torque monsters, even for their relatively small size cubic inch size. BigBlue 94 and loki1981 like this. White Dragon and loki1981 like this. Sweet. So SAS up front? been running alcans out back on my rig since I did my solid axle swap. think they changed ownership, at some point but I know they make a great product.